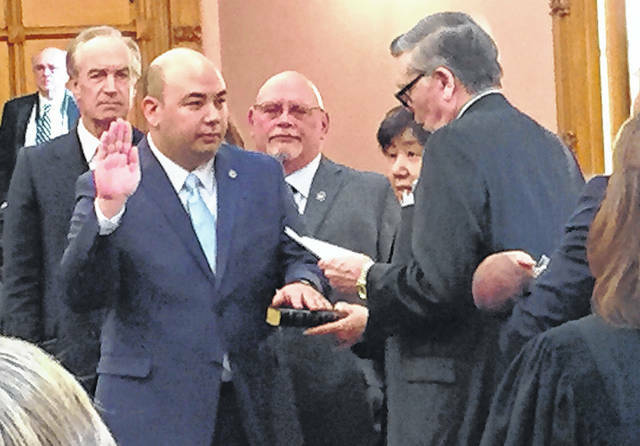 Ohio House Speaker Cliff Rosenberger is shown taking the oath of office in this file photo. Rosenberger announced his intention to resign May 1, but some lawmakers are suggesting he should step aside immediately. A growing chorus of elected officials on Wednesday called on Ohio House Speaker Cliff Rosenberger to resign immediately rather than wait until May 1, as he said he would do when he announced late Tuesday his intention to step down. Republican gubernatorial candidates Mike DeWine and Mary Taylor, along with state Auditor Dave Yost, have all said Rosenberger should step aside now. But Democrat Richard Cordray said it was “highly inappropriate” for DeWine, currently Ohio’s attorney general, to call Rosenberger in the middle of a federal investigation and the exchange should be investigated. At issue is a call DeWine made to Rosenberger Friday after reading the lawmaker had hired a lawyer amid FBI questioning. DeWine said Wednesday he called Rosenberger and urged him to resign “out of concern” as a party leader. He said he had no inside information on any investigation. Rosenberger, who faced term limits in January, resigned Tuesday , effective May 1. DeWine says Rosenberger shouldn’t wait. Rosenberger’s decision to announce his resignation came amid reports of an FBI investigation. Details have been scarce, but some sources say the investigation involves travel taken by Rosenberger and paid for by others, among other issues. Rosenberger denied any wrongdoing. The reverberations from the events surrounding Rosenberger were being felt in local races. Two Republicans are seeking to win the party nomination for Rosenberger’s 91st District seat, and one of them Shane Wilkin, a Highland County commissioner, issued a statement Wednesday aimed at his opponent, Clinton County businesswoman Beth Ellis, and the support she has received from Rosenberger. Ellis said Wednesday the news about Rosenberger was “disheartening,” and that OHROC is a respected organization. She denounced what she said was an increasingly negative campaign against her. Ellis said she was disappointed to see negative ads being directed at her “from in and out of state supporting my opponent.” She said she denounced them. https://www.timesgazette.com/wp-content/uploads/sites/33/2018/04/web1_Rosenberger-sworn-in-1-1.jpgOhio House Speaker Cliff Rosenberger is shown taking the oath of office in this file photo. Rosenberger announced his intention to resign May 1, but some lawmakers are suggesting he should step aside immediately.